North Korea’s growing arsenal of ballistic missiles and nuclear weapons poses a grave regional and global threat. 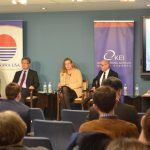 On February 14-16, 2018, Sasakawa USA, in partnership with the Sasakawa Peace Foundation of Japan (SPF), held a tabletop exercise (TTX) with experienced Japanese, South Korean, and American military, security, intelligence, and diplomatic officials to explore trilateral responses to credible North Korean provocations. The unclassified exercise took place at SPF headquarters in Tokyo. SPF and its staff deserve special thanks for their efforts at ensuring that a TTX of this scale operated smoothly and efficiently. SPF’s support and commitment made certain that every aspect of the two-and-a-half day event was professionally and graciously addressed. Without this noteworthy effort by SPF, the TTX would not have been possible. 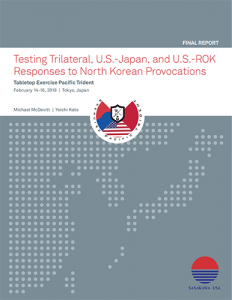 TTX participants were presented with North Korean crisis scenarios in the Sea of Japan/East Sea and around the Korean peninsula intended to test U.S.-Japan, U.S.-ROK, and trilateral reactions. Participants formulated their responses based upon existing policies and current consultation, coordination, and communications procedures, including those implemented recently by Tokyo and Seoul to expand their contributions to coordinated operations. The exercise clearly demonstrated the importance of trilateral cooperation in effectively addressing a major North Korea contingency. It also identified important issues that should be explored in additional track two TTXs. The exercise was held during the first week of the 2018 Pyeongchang Winter Olympics, a period of optimism in South Korea over relations with the North as Pyongyang sent a delegation of athletes, delegates, and cultural envoys to the games. Subsequently, talks between South and North Korea led to the two countries agreeing to a summit meeting in April 2018, possibly followed shortly thereafter by a meeting between President Donald Trump and Kim Jong Un. While these developments provide hopeful signs that tensions on the peninsula will yield to peaceful inter-Korean coexistence, and perhaps even denuclearization of North Korea, the long history of North Korea’s refusal to abandon its nuclear program suggests that future serious DPRK provocations cannot be discounted, particularly if Pyongyang’s nuclear and missile capabilities remain unchecked.